It’s no big surprise that unless you specialize in treating children and adolescents, your patients’ average age will rise significantly as baby boomers continue to swell Medicare ranks over the next few decades. Elderly patients bring special needs and inherent risks that you must not ignore—at peril of exposing yourself to accusations of neglect and malpractice. Aging naturally brings several diminished capacities—sometimes severe, often hardly detectable— that require vigilance on your part. Age-related challenges may require you to compensate for physical limitations like failing eyesight and hearing, as well as for lost mental acuity—from mild forgetfulness to serious dementia. You’re not likely to overlook obvious problems like a patient with advanced Alzheimer’s or near deafness. But mild symptoms and subtle changes can sneak in under the radar and get you in trouble. Therefore, implement an office-wide program to train and sensitize everyone to be alert and ready to meet the special needs of your elderly patients. Mental capacity: Primary care providers and specialists who treat patients over a significant time period have an advantage in monitoring a senior’s mental acuity. Develop simple, objective questions and tests, and track the patient’s performance over time. Significant others: Make sure that available family members have the authority to be involved in caring for the patient first. 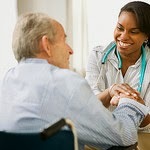 Then involve them in the “care team” for communicating, decision-making, and patient compliance. Medication monitoring: Most practices ask patients—especially older ones—to bring all their current medications with them to the office. This is still the best way to minimize adverse medication interaction—at least until we have a reliable e-prescription system in place with shared access across practitioners and providers. Elder abuse/neglect: Some physicians insist on initially evaluating elderly patients alone— sometimes angering accompanying spouses or adult children. This allows the doctor to pursue any suspicious signs or symptoms. Providers in many states are required by law to report suspected abuse or neglect—and reporting procedures vary from state to state. Providing visual clues (diagrams, pictures, etc.). Finally, take a good look around your office, and try to see your facility through the eyes of an older patient. For example, is your front door hard to open? Are your exam tables tall and difficult for a senior to get on? Is your automated telephone system complex and confusing? The list goes on and on. So challenge your whole staff to join in the office review. It can open your mind to a whole new way to view things.